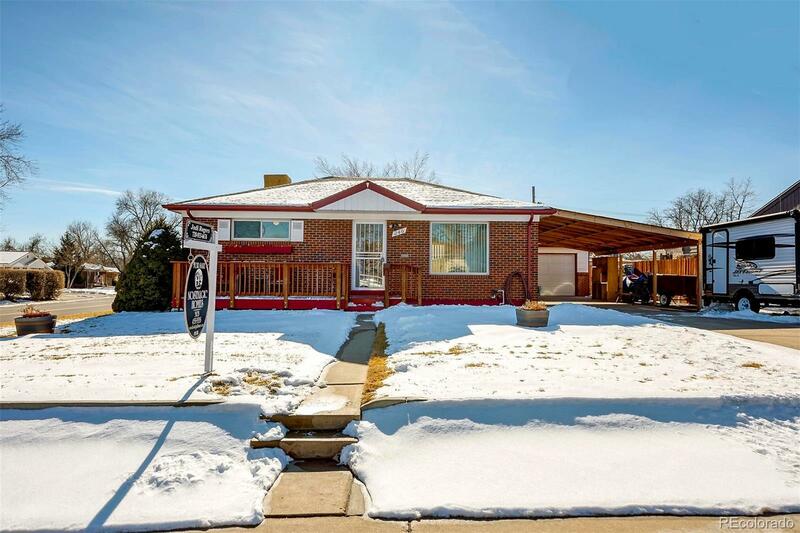 THIS DARLING RED BRICK RANCH IS SITUATED PERFECTLY ON A CORNER LOT WITH A WELL MAINTAINED YARD AND MULTIPLE DECKS AND PATIOS FOR ENTERTAINING FRIENDS AND FAMILY ALIKE. THE NICELY APPOINTED KITCHEN HAS PLENTY OF LIGHT AND EAT IN DINNING. BEAUTIFUL WOOD FLOORS ARE IN GREAT CONDITION. BASEMENT IS CURRENTLY BEING USED AS MOTHER-IN-LAW WITH A KITCHENETTE, SPACIOUS LIVING ROOM, BEDROOM, AND BATH. IDEAL ARRANGEMENT FOR A ROOMMATE OR COLLEGE STUDENT. TWO CAR OVERSIZED GARAGE PLUS A CARPORT IS A DREAM COME TRUE FOR THE CAR ENTHUSIAST. FANTASTIC LOCATION FOR COMMUTERS, CLOSE TO DENVER AND BOULDER.